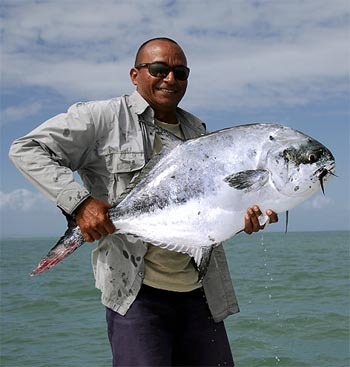 From December 2008, Loop Adventures in cooperation with Planet Fly Fishing and Casa Batida will take over the management of the fishing area north coast of Villa Clara province in Central Cuba in the west sector of Jardines del Rey. Unesco has declared this region a reserve of the biosphere. 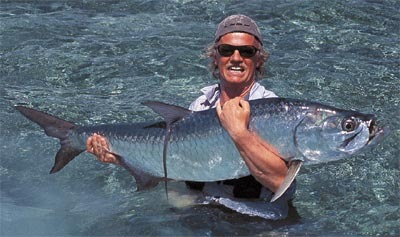 The area is beautiful and has all attributes for flyfishing with channels, mangroves and flats and world class tarpon! The area is not very famous in Europe - yet - but it has proved a very good fishing potential for big tarpons, jacks, cudas, snappers, grouper, etc. during the past seasons, and the Loop guys are working hard scouting all the scenes. 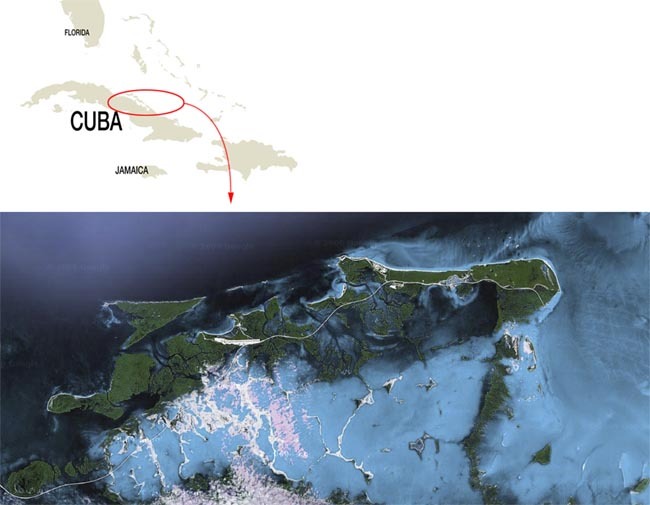 To get to Cuba, you will need to make travel arrangements to Havana, Cuba. When you disembark in Havana you will be provided with a VIP Facilities Pass. This will enable you to bypass the long lines at Immigration, and your bags will be brought to you in the separate VIP Salon were you can have free drinks and food. NB: Be prepared and have the luggage receipts ready! You will be met at the VIP Salon or outside in the customs hall by a Casa Batida representative holding a sign. On meeting, he will give you all the necessary vouchers for your stay in Cuba. He will then tell you where to pick up the van that will provide the transfer to your hotel in Havana, where you will overnight. You must give the driver your transfer voucher for this leg of the journey. The drive between Jose Martin airport and Havana takes about 30 minutes. You must have a valid US passport and a Visa (valid for 1 month) to enter Cuba. The Visa is to be purchased together with your flight ticket or from your travel agent. Assistance with obtaining a Visa is available. The Cuban Government has made the area around Santa Maria a nature conservation area - Casa Batida’s playground. The cays of Cayo Santa Maria / Las Brujas are uninhabited and apart from those that you fish with the only people you will see are a few commercial lobster fishermen. 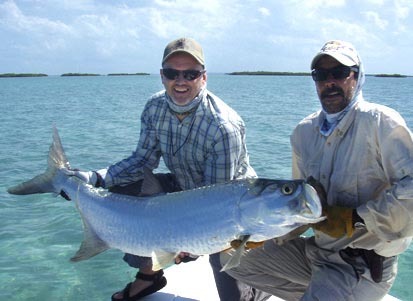 Cayo Santa Maria / Las Brujas are therefore ideal habitats for bonefish, tarpon and permit. It is made up a series of cays, channels, mangrove lagoons and flats. The flats tend to be white sand interspersed with turtle grass ideal for those who want to wade. Around the cays are mangroves and the wading can be a little trickier so fishing is primarily done from the boats. Most days you will have the option of either fishing from the skiff or wading. Through the flats and cays you find deeper channels that provide perfect areas for tarpon to feed on the bountiful shoals of sardines but when the tides are right you can see them move onto the flats providing great sport. Fish from 10 to 80 lbs are present all year long with the huge migrating tarpons (up to 200 lbs) arriving in numbers from March onwards. Likewise on the slightly deeper parts of the flats you will see schools of permit and tarpons and many times you will feel the Grand Slam is seemingly moments away. When sight fishing, especially for bonefish and permit, most anglers prefer the hours of 8 am to 3 pm. Earlier and later, the sun causes a glare, making fish difficult to see. Even so, after 3:30 pm, tailing bonefish are visible against the bright light up until dusk making for some of the most exciting fishing. There are some areas that have still not seen a fisherman or a fly, and part of the fun will be finding new and productive areas. Each evening the director and the guides will determinate the next day’s schedule on the basis of the clients input and careful rotation of the productive areas to ensure the grounds are rested. For the fishing schedule, you can have breakfast at the hotel from 7.30 am onwards. Pack your picnic lunch at the hotel and be ready at approximately 8 am for transfer, appr 10 minutes drive, to the marina. On arrival your rods and equipment will be ready in the skiff to depart for fishing at 8.30 am. Lunch is usually held at one of the picnic spots that are dotted along the archipelago but please ensure that you advise your guide what drinks you require before departing in the morning. Skiffs aim to return to the marina at 4 pm. You will fish with one guide throughout the week. Please be aware that each guide has a varying degree of conversational English but all are learning. They do though speak enough to convey the important information of where fish are and when to cast. They will base their instructions on the clock method with 12 o’clock being the bow - simple easy and effective. There will be 8 boats available. Four of the boats are Hewes Bonefisher 17 with 75hp and 90hp (those we had in Cayo Largo) and four brand new Carolina Skiff Sea Chaser with 60hp. They are all equipped for fly and spinning, with cooler, life jackets, first aid kit, and radios. Most flyfishing guides are the same that worked with Fabrizzio in Casa Batida at Cayo Large with long experience of flyfishing.